Kaiser Permanente physicians and employees have a proud history of donating their time, talent, and resources to people in need, both at home and around the world. But perhaps only one department in the region can boast a team with as deep a commitment to international service as the North Valley Department of Anesthesiology. 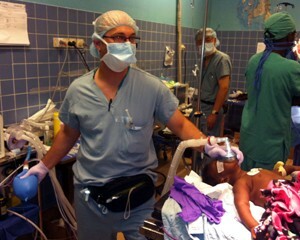 In the past 2 years, at least a dozen anesthesiologists and certified nurse anesthetists (CRNAs) from the North Valley have volunteered abroad, using their vacation time to serve people who would otherwise not get medical care in places such as Cameroon, Rwanda, Tanzania, Bolivia, Ecuador, Guatemala, China, Vietnam, and the Philippines. Erin Kong, MD, chief, Department of Anesthesiology, Sacramento, says she supports and encourages members of her department to volunteer abroad because it’s the right thing to do and because she’s seen so many volunteers return more passionate and energized about their work. “We have an amazing skill set. And when you’re able to use your skills as a medical provider to help people in developing countries, you remember why you went into medicine in the first place: to help and to serve others,” Dr. Kong said. But Dr. Kong says the true inspiration for her department’s commitment to service abroad comes from her current assistant chief and previous department chief, Chih-Chen Fang, MD. 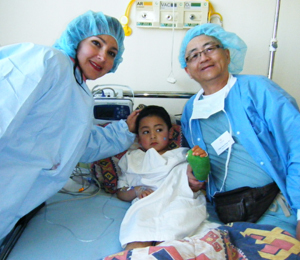 Dr. Fang has volunteered for 9 international medical trips over the past 7 years. He says he was drawn into international service after his first mission: a one-week trip to China working with KP Roseville’s pediatric ophthalmologist James Ruben, MD, who performed pediatric strabismus and cataract surgeries. Since then, Dr. Fang has done 7 other medical missions, mostly dedicated to repairing cleft lips, cleft palates, burn scars, and hand deformities. He now volunteers with the nonprofit groups Resurge International and Alliance for Smiles, and he has inspired many of his colleagues to do the same. Brad Keizer, CRNA, is one of the many people inspired by Dr. Fang’s volunteer work. 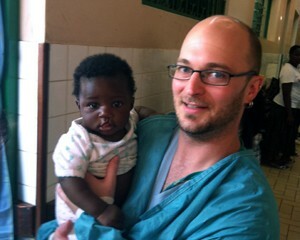 Keizer volunteered with Alliance for Smiles in Cameroon last April and Tanzania last August. He says the surgery days can be long and rigorous, but when you’re part of a team that’s making people (often children) whole through a cleft lip or cleft palate repair, you get a lot of satisfaction. “I get to see the appreciation of the families. And after the surgery, the patients can eat properly, they’re accepted back into society after being shunned, and they can have a normal life,” he said. Beth Janson, CRNA, who volunteered with Alliance for Smiles in Rwanda in July 2011 and China in October of last year, says she gets as much from the mission trips as she gives. Janson credits her department managers and co-workers for supporting her and her colleagues in their international service. When volunteers return to their work at KP in the North Valley, they’re asked to lead a presentation for their colleagues about the trip, complete with photos, stories, and informal discussion. Dr. Kong says that the international service and the sharing add to the fulfillment of the entire department.